Amazon recently published some numbers showing how Amazon S3 (Amazon’s “cloud-based” storage service) has grown over the years. They even included a chart, which you can see here below, which clearly shows how the number of objects stored in S3 has exploded. Considering Amazon has been leading the pack of cloud services that have swept across the Internet, such growth is not really all that unexpected, but it’s impressive nonetheless. It does raise some interesting questions, though, like, how big will Amazon S3 become? How big will Amazon S3 be in one year? In two years? 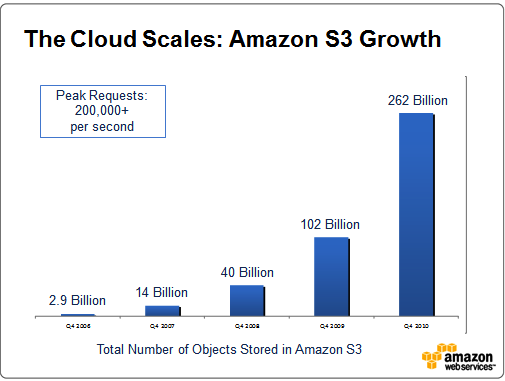 Amazon S3 has so far been growing exponentially. If you look at the past three years, the service has grown by between 155–185% each year. Let’s assume this growth rate continues for the next couple of years. Thanks to Amazon’s leading position in this expanding market, that is not at all unlikely. Besides, the growth rate has been almost identical two years in a row now. Assuming a 155% yearly growth, i.e. the most modest year so far, we can add predictions for 2011 and 2012. One could argue if this is actually where Amazon S3 is headed, there are many factors at play here, but simply based on the growth of the past three years, this is what we would end up with. 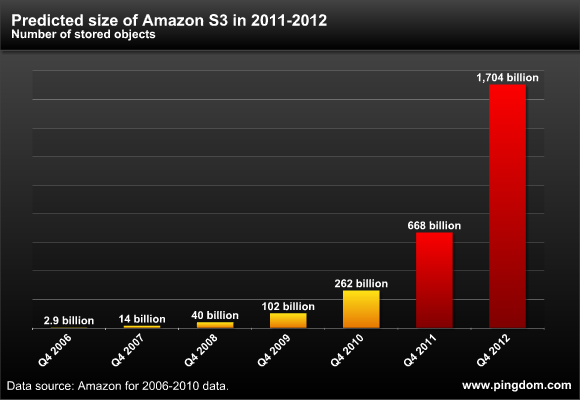 Sometime in 2012, in little more than a year, the number of objects in Amazon S3 is likely to pass one trillion, i.e. a thousand billion. When they do, expect plenty of champagne corks popping into the air over at Amazon. Our chart also makes it exceedingly obvious that Amazon has a significant scaling challenge ahead. Not only will the service have to store massive amounts of data, and do so reliably and without hampering performance, but you can expect the number of requests for that data to go through the roof as well. The service is already handling up to 200,000 requests per second, but that’s nothing compared with what’s to come. Amazon is going to need a lot of servers, and a lot of bandwidth. But we bet, in this case, they really won’t mind. I have used amazon cloud and rackspace cloud and from my experiences I would much rather host my stuff using rackspace, their support is so much better and are always there to help via live chat. – Many are services are configured to add to S3, and never delete. It may be more interesting to look at a line graph of additions rather than a total number bar graph (marketing dept’s…). Monthly requests is an interesting number, since that is where S3 earns mosts of it’s money which pays for the the underlying server farms.